This a continuation of yesterday's entry. Orders of battle of armies of superpowers during WWII can be difficult to grasp. Hearts of Iron 3 Semper Fi has a great OOB browser (see screenshot below). 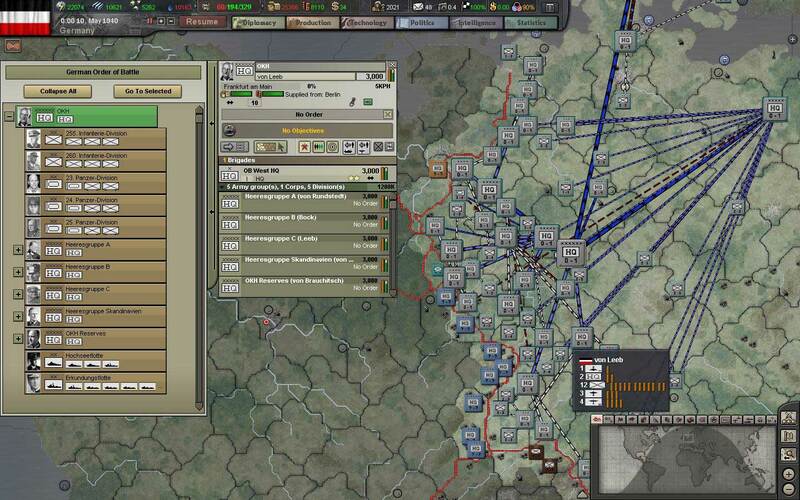 It is also possible to reorganize forces according to your preferences. In the next screenshot, I clicked on the HQ unit command the West Theatre (OKH) and I changed its stance to "blitzing" for land forces, to "offensive" for air units, and "defensive" for naval units (I don't want to mess with the Royal Navy). These stances will guide all actions of the land, air and naval units under the command of OKH. The next step was to give OKH three objectives: Amsterdam, Bruxelles and Paris. In theory that is all I would have to do and let OKH take care of the whole theatre of operations. 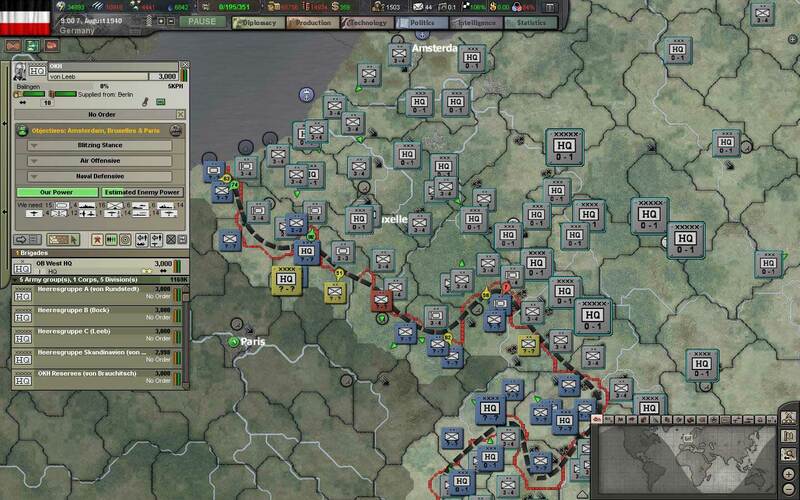 By the first week of August 1940 (3 months into the operation), Amsterdam and Bruxelles have fallen. Paris is still out of reach. 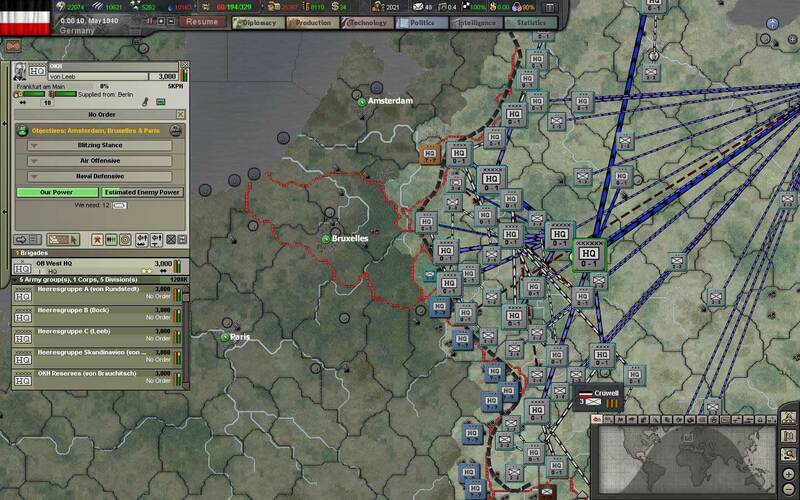 Later in August, we are closing into Paris, but the Allies are putting a good fight for the city. 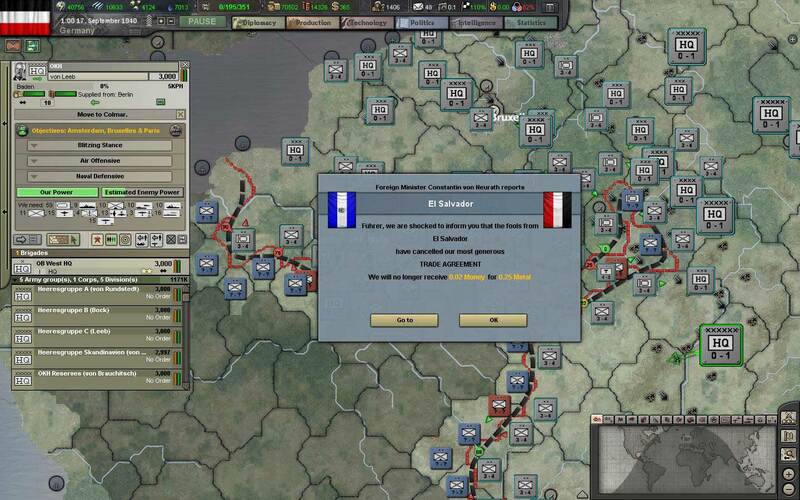 September begins, and Paris still is in the Allies hands. 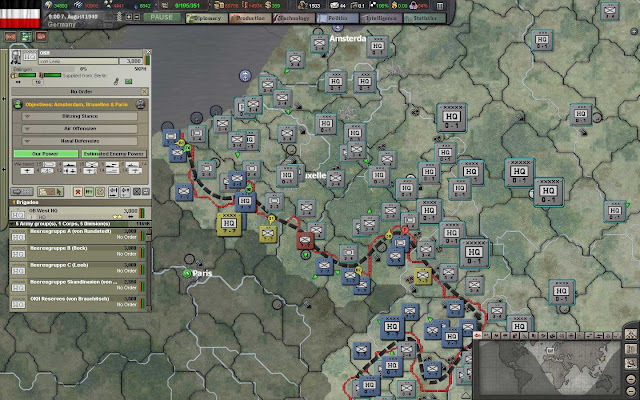 Note the encirclement threatening the Allied units in the East. In the next entry, Paris falls! I really dislike HOI3. I just cant get into it but cheers to you for trying. We will see where this leads to. Same here. HoI just doesnt " Kick in " for me. Good game. It is easy to get into, because you can automate everything in game. You can even have hands off games to watch how the AI plays, just for fun. Automate everything and gradually get into the things you want to learn. The only thing I automate is the bulk of my armed forces. I'm starting to like this HoI3 thing. Just picked up Semper Fi as well, and thus far it appears substantially more polished than vanilla HOI3. Still, the game is daunting. I think the previous recommendation about initially letting the AI handle most everything and then slowly taking over specific areas of responsibility is a good one. What I'd really like is to hand off all the boring crap and focus on handling whatever theatre needs a "fire brigade" at the moment. 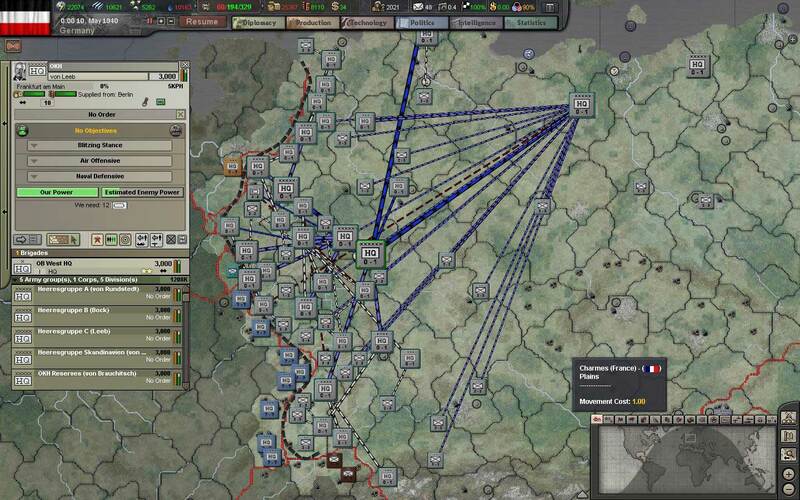 Sort of an operational-level game with a grand strategic backdrop. I just can't believe the friendly AI will be up to the task, but I can hope! I've been playing HOI3 without Semper Fi for a few weeks now and I have to ask: How do you get those dashed lines to appear marking the front? Is that a Semper Fi change? Thanks for your comments and sorry for the late response. @ Anonymous: this a SF change. Just give a formation an objective and every time you click on the HQ unit of that formation, the dashed line will appear. 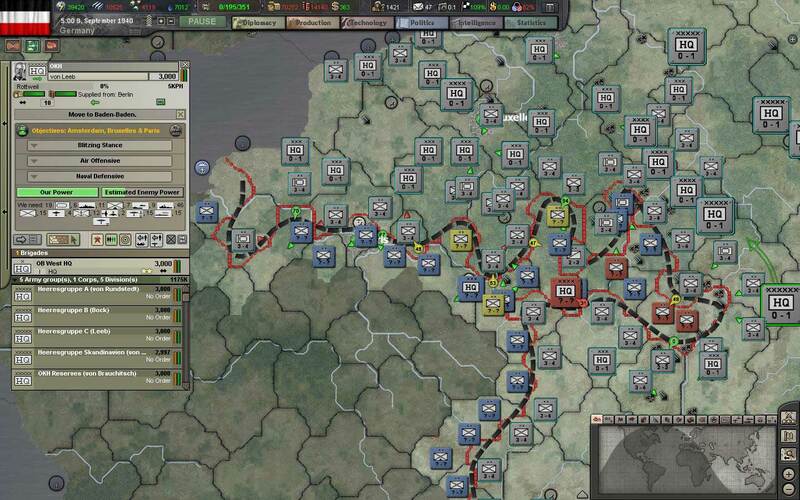 Good to see you give HOI3:SF a go. 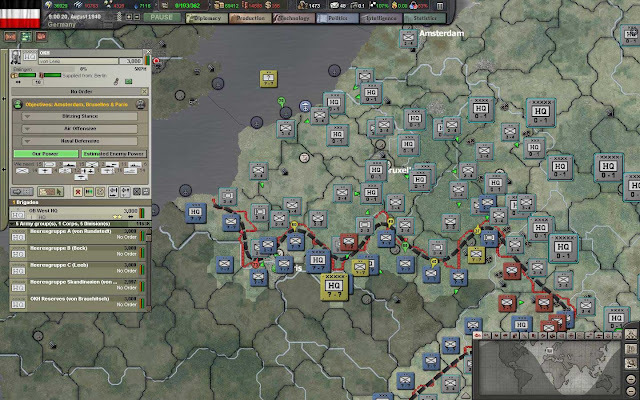 I really think SF made HOI3 into a good game. I hope one day they will implement the mechanics for true blitzkrieg though, this 'delay modifier', after every battle for a province, seriously hampers blitzing.